Generally, you have the opportunity to access and visit the website without having to provide any personal information. When you visit our website, we will store information that is independent of your personal details (e.g. the date, time and duration of your visit, the pages you view and the website from which you are visiting us). The corresponding information consists of the name of the website, the file, the current date, the time of the server request, the amount of data, the web browser and its version, the operating system used, the domain name of your Internet provider, the referrer URL as the page from which you switched to our site and the corresponding IP address. The IP address is stored anonymously. We use this data to show and deliver our content as well as for statistical purposes. The information supports the provision and constant improvement of the content we offer. Consent (art.6 para.1 sentence 1 lit. a. DSGVO). Contractual obligation (art.6 para.1 sentence 1 lit. b. DSGVO). Balance of interests within the context of a legitimate interest (art.6 para.1 sentence 1 lit. f. DSGVO). We use the e-mail address to contact the e-mail sender. Only takes place within the context of the application named in point G.
This website uses the open source web analysis service Piwik. Piwik uses so-called ‘cookies’. These are text files which are stored on your computer and which enable an analysis of the use of the website by you. To this end, the information concerning the use of the website produced by the cookie is stored on our server. The IP address is anonymised prior to storage. The information produced by the cookie concerning the use of this website is not passed on to others. You can prevent the storage of cookies by correspondingly setting your browser software; however, in this case, we would like to point out to you that as the case may be, not all of the functions of this website will be fully usable. If you disagree with the storage and usage of your data, you can deactivate the storage and use function under I. In this case, an opt-out cookie is stored in your browser, which prevents Piwik from using your usage data. If you delete your cookies, this results in deleting the Piwik opt-out cookie. The opt-out has to be reactivated when you visit our site again. Piwik logs, which are older than 730 days are deleted. We use the service ‘Google Maps’ on our website, so that you can create a journey plan in order to find us. The operator of the ‘Google Maps’ service is Google Inc., 1600 Amphitheatre Parkway, Mountain View, CA 94043, USA. By using this website, you consent to the recording, processing and usage of data, whether it be the data you enter or the data automatically collected by the ‘Google Maps’ service by the service provider. Transparency and options as well as Provisions relating to data protection. The data you provide (so-called personal data) will be encrypted and transmitted via the Internet via SSL. Reference is made to F and the information there. 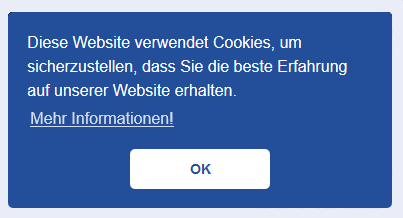 If you click ‘OK’, the cookies are saved. If you do not agree with the storage and use of your data, you can disable the storage and usage here. In this case, an opt-out cookie is deposited in your browser that prevents Piwik from saving usage data. If you delete your cookies, this will also result in the Piwik opt-out cookie being deleted. The opt-out must be reactivated when visiting our site again. Personal data will be stored for as long as necessary to fulfil the contractual obligations and the person responsible must comply with legal, statutory or contractual retention periods which require the personal data to be stored. Information (art. 15 EUDSGVO; sect. 34 BDSG). Deletion (art. 17 EUDSGVO, sect. 35 BDSG). Restriction relating to processing (art. 18 EUDSGVO). Right to data transferability (art. 20 EUDSGVO). Please contact the data protection officer under point B. The right of objection (art. 21 EUDSGVO, sect. 36 BDSG) against the processing of personal data or against the receipt of advertising under the processing of personal data can be exerted at any time. To do this, you must address the objection to the data protection officer under point B. The user can revoke the consent he has given to the processing of personal data at any time. The revocation of consent does not affect the legality of the processing carried out on the basis of the consent up until the revocation. The revocation must be addressed to the data protection officer in section B. The visitor to the website, as the aggrieved party, has the right to complain to the competent supervisory authority pursuant to art. 77 EUDSGVO if he considers that the processing of his personal data has been unlawful. In accordance with the new General Data Protection Regulation (GDPR), we would like to point out that data that is required in the course of the transaction is processed and stored. The legal basis is the consent, contractual obligation and the balancing of interests within the context of a legitimate interest (article 6, para. 1, sentence 1 letters a., b., c., f. GDPR). In the case of customers or recipients of goods that are based in a third country without an appropriate level of data protection according to the GDPR, article 49 GDPR para. 1, letters a., b., c., e. is automatically deemed as agreed. The customer/client (data subject) states and provides his consent. Your data is only passed on within the scope of processing shipments. Personal data is stored for as long as necessary to fulfil the contractual obligations and the responsible party has to comply with legal, statutory or contractual retention periods, which require the personal data to be stored. We reserve the right to a possible credit check, use of credit monitoring and/or transfer of data to business information services such as Creditreform. A general transfer of personal data to third parties e.g. for advertising purposes does not take place. We expressly point out that the e-mail is sent unencrypted. Modification or knowledge of the data by unauthorised third parties cannot be ruled out definitely. The rights to aggrieved parties are listed under letters K, L and M.
Note: The solely binding version is written in German. Other language versions are translations that may deviate in content and are not binding.